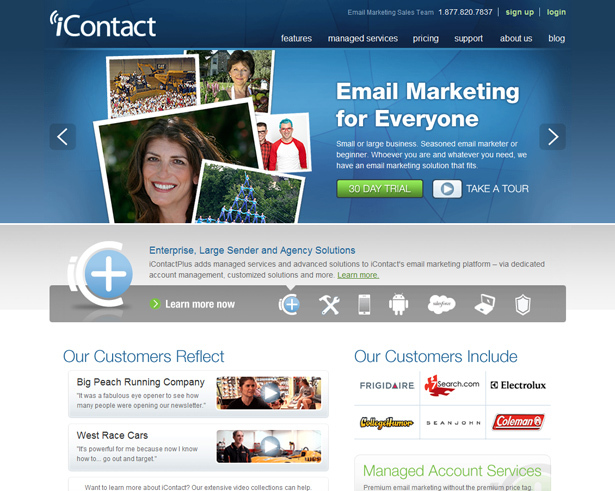 Selecting an email marketing service can be daunting. There are dozens of solutions to choose from, all with extremely varied options, features and pricing. Even more perplexing is that many reviewers rate these solutions in an effort to identify the “best” option. There is no single best option, but rather a lot of great options. You just have to find the one that matches your needs. Unlike the exhaustive round-ups that cover every option available, I have narrowed the field to what I consider four of the best. All of these are terrific solutions that address a variety of needs. I won’t mention every last feature of these services. Because they all have the same basic functionality, I will focus on what makes each distinct and what to expect from using them. MailChimp is well known in the email marketing arena, thanks to its stylish design and heavy marketing. 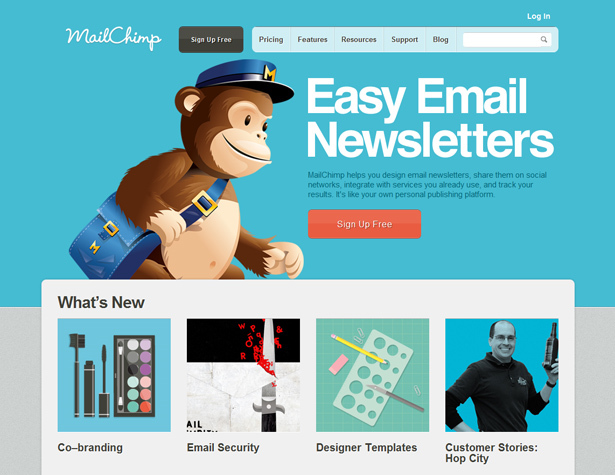 But MailChimp is more than a beautiful tool with a memorable mascot. The first thing you’ll notice is that the interface is incredibly easy to use. 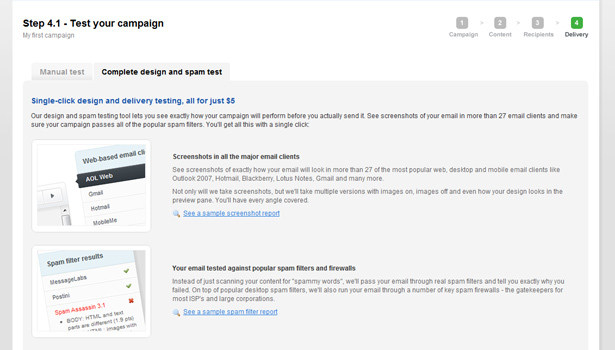 While MailChimp’s service is highly technical, the interface is polished and simple to use. Regardless of your skill level, you will appreciate the simplicity it brings to email marketing. 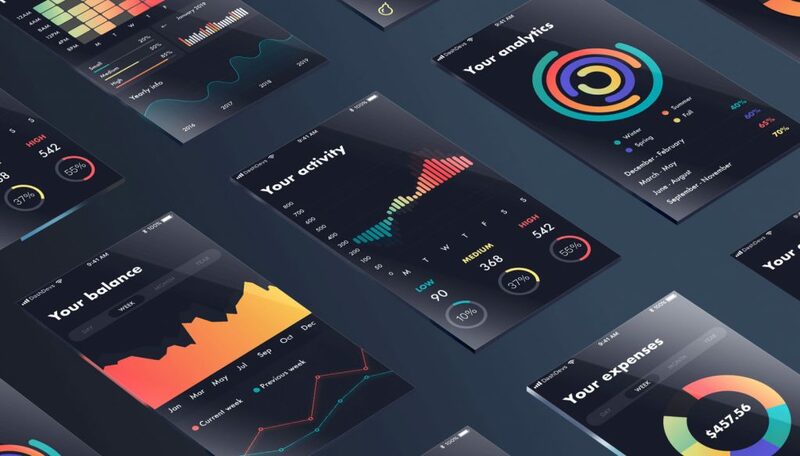 The main dashboard is central to all web applications. 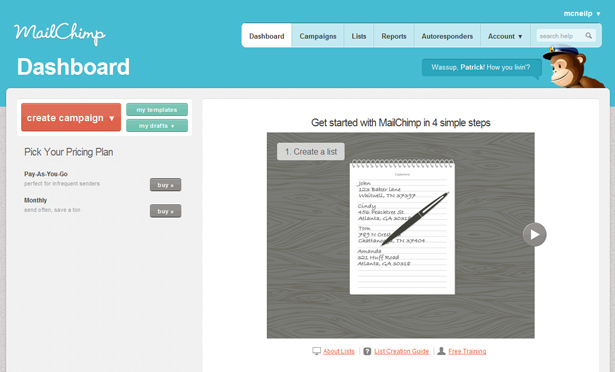 MailChimp’s dashboard guides you into the system so that you can quickly begin creating lists and sending emails. One of the biggest hurdles to email marketing is generating the actual HTML for the email campaign. 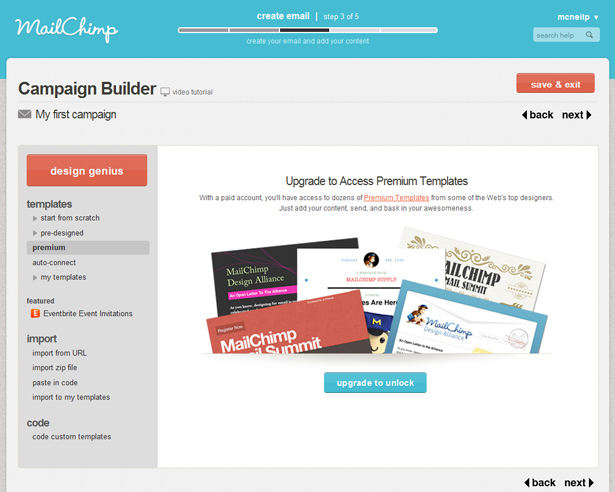 MailChimp allows you to use your own code, of course, but it also provides full free templates, all coded and tested. They are also fully integrated in MailChimp, which means they are set up to leverage all of the application’s options, freeing you to just jump in and send emails quickly; no need to become intimately familiar with MailChimp’s templating system. MailChimp also offers premium templates, but the label “premium” hardly does these amazing templates justice. 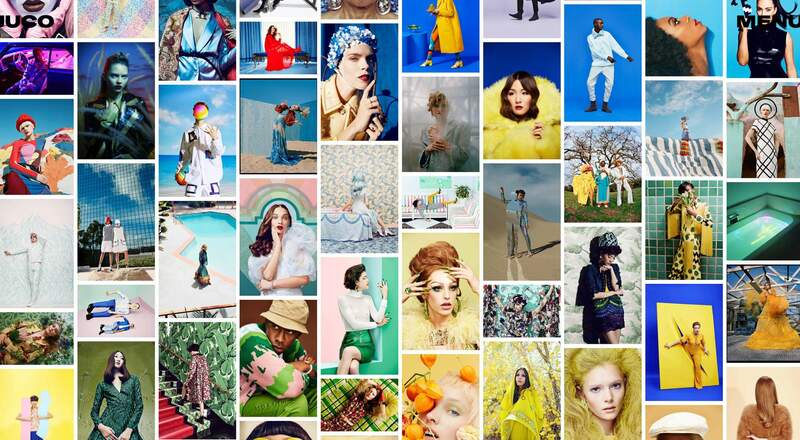 While you’ll find free or cheap templates on the web, they won’t likely hold a candle to these. Even better, they are free with all paid accounts. 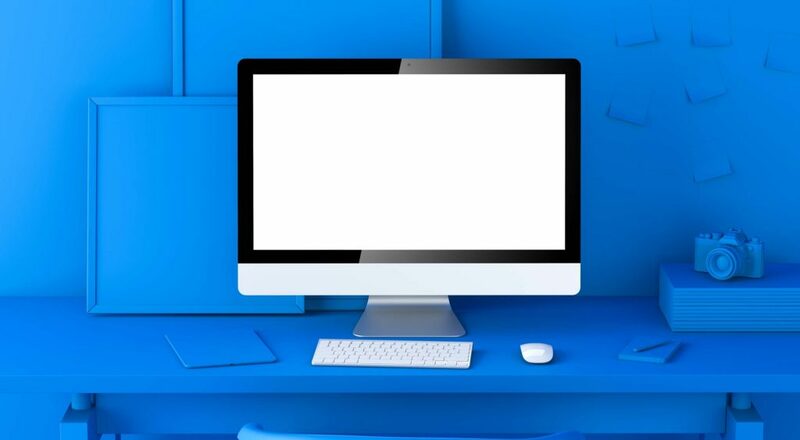 This is your chance to send emails designed by world class professionals such as Veerle Pieters, Elliot Jay Stocks, Jon Hicks and Matthew Smith. A critical component of any email marketing service is the process by which website owners populate their mailing lists. MailChimp offers a robust range of options. 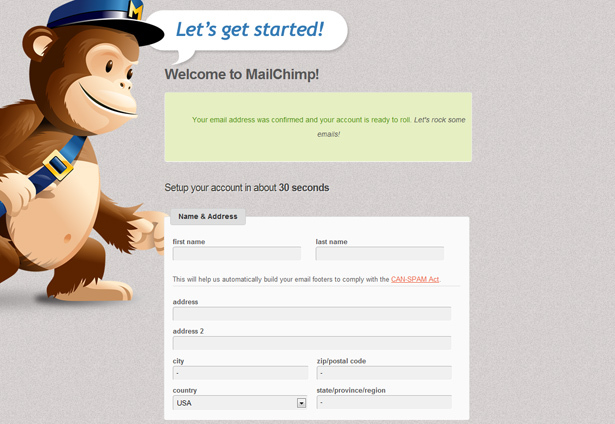 You can build a form that is hosted by MailChimp and simply link to it from your website. A more enticing option is to embed it on your own website. Fortunately, MailChimp lets you extensively customize the embedding code, making it easy to get what you want without digging too far in. Many people have a few contacts on their mailing list who are especially important and who they want to carefully monitor. MailChimp has a unique feature that lets you do just that. Once you flag VIPs on your list, you can easily track their engagement with your campaigns using the iPhone or Android app. Even better, the push technology notifies you when they are active, meaning you need not check back constantly. MailChimp really shines with third-party support. As you can see below, integrating with many popular online services is straightforward. VIP monitoring allows you to track key subscribers. MailChimp has a lot of pricing options. Perhaps most enticing is the free plan for 2,000 subscribers and 12,000 emails per month. This “forever free” plan is fantastic for small companies looking to get started with email marketing. There are also monthly, pay-as-you-go and high-volume plans. The monthly plans charge based on the size of your mailing list and include unlimited emails to your list. The pay-as-you-go option offers credits that work like stamps, a great option for less frequent usage. 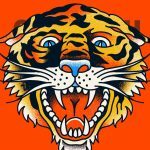 MailChimp is an incredible service, and its reputation in the industry is easily justified by the product. 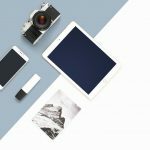 It is packed with a ton of incredible features that make it rather unique in the marketplace. I really love how easy it makes it to get started. 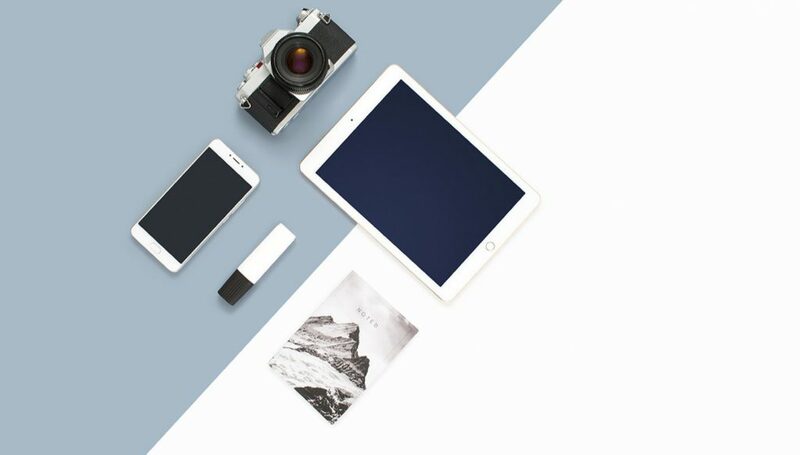 With the forever-free plan and the slick ready-to-go templates, getting started at almost no cost is a breeze. 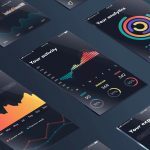 Campaign Monitor is another industry leader and well known throughout the design and development community. Its feature set is tremendous and nearly impossible to cover briefly. So, let’s explore just a few key features as a quick introduction. 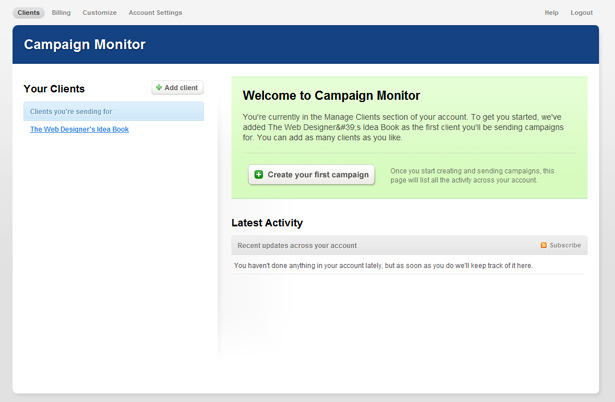 Like MailChimp, Campaign Monitor focuses on usability, and the system is clear and simple to get started with. 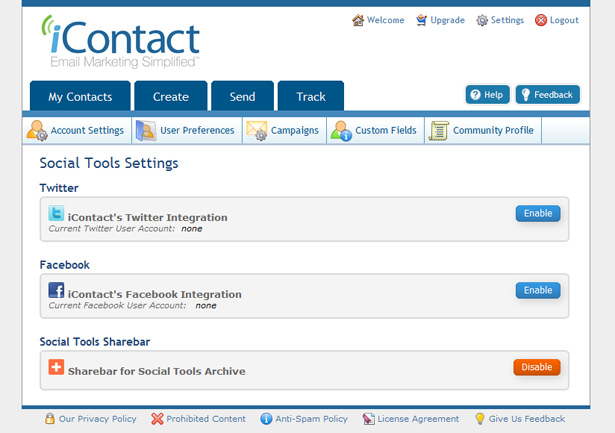 As you can see below, the dashboard for new accounts is simple, and the user is quickly guided to the first step. One of the best things a service like this can do is simplify the process, a huge part of which involves providing information along the way. When you create a new campaign, for example, every field is accompanied by a description of what it does. You don’t have to hover over elements, read pop-ups or click over to long-winded help pages. The documentation is built into the process and demystifies the objective of each step. 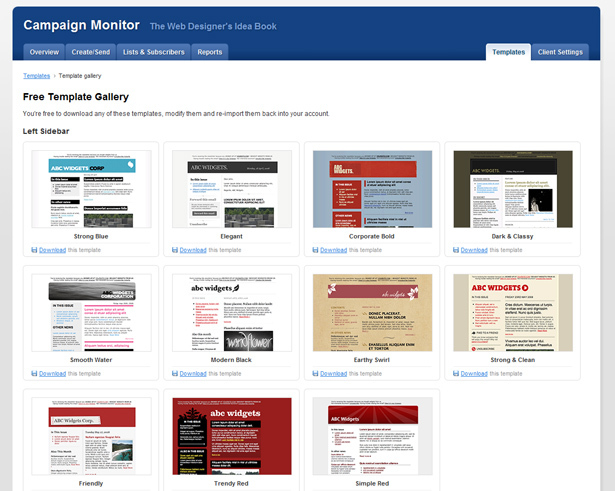 Campaign Monitor lets you build a library of templates to reuse in campaigns. 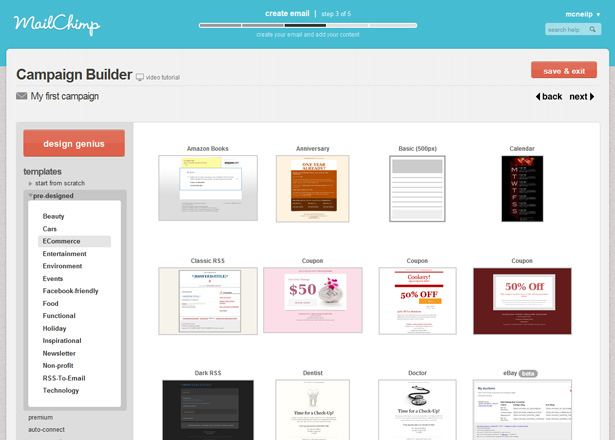 Two sample templates come pre-loaded, with more free options to be found by digging deeper. These templates are ready to go, fully coded and tagged to work with Campaign Monitor. The only gotcha is that you have to download them and then import them into your account. There is no super-easy way to start using them immediately. Not a terrible problem, but this might prove complicated for less tech-savvy users. One thing to love is how the system integrates analytics into its list-management features. 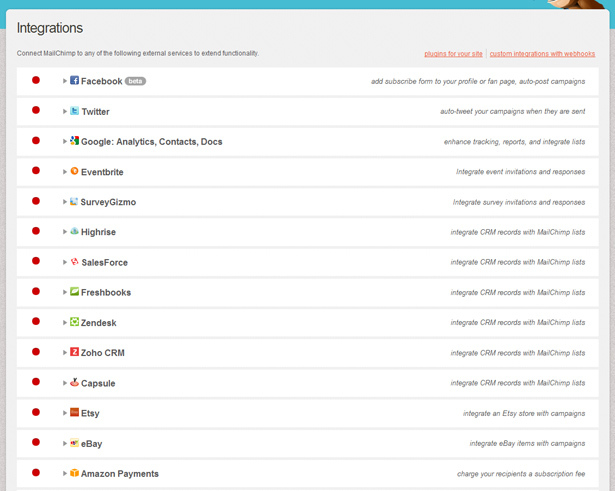 As you can see below, you can view stats for the list in the same area where you manage subscribers. Not having to jump to a separate reporting system for your stats makes things very easy. In fact, in the same area where you manage subscribers, you can easily jump to many related features, such as the auto-responder, subscription forms, landing pages and unsubscribe settings. While this might seem trivial, it’s very nice never feeling like you have to hunt for a particular feature. The system is built to predict your needs in the context of the current view. Testing your email in various clients by hand is a painful process. Fortunately, Campaign Monitor has a full testing service built in. Even better, it is integrated in the process for building campaigns, so it is easy to make it a basic part of launching a campaign. This service is not included with the standard fees; it costs $5 per test. Still, being so well integrated in the system makes it easy for those who would otherwise ignore this critical step. 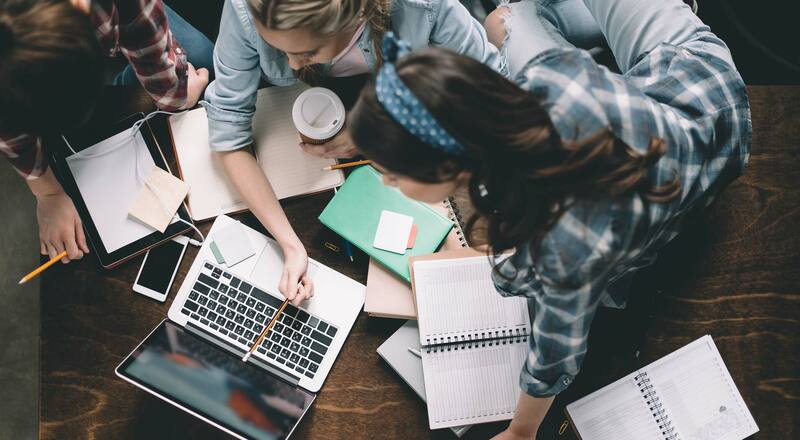 If you’re looking to make email marketing a standard part of your services to clients, Campaign Monitor offers a fantastic client-management system. You can easily set up sub-accounts for clients to help them build email templates for their own use. Additionally, you can pad the fees charged by Campaign Monitor to earn extra revenue every time your clients send emails. 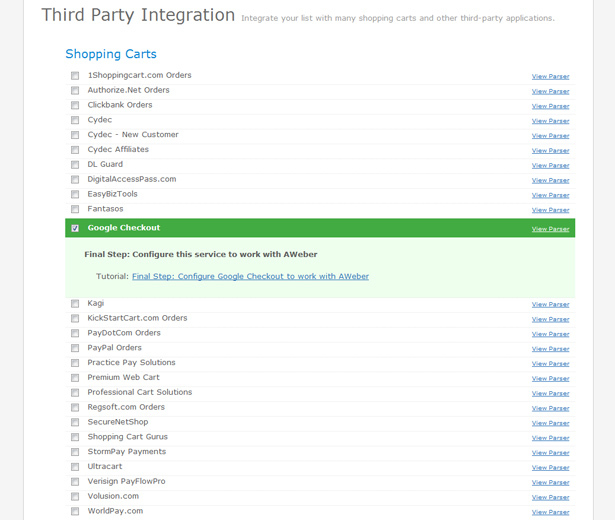 E-commerce integration with Shopify, Magento and others. Campaign Monitor has multiple pricing options, including monthly, high volume, and pay as you go. You can purchase monthly plans for unlimited campaigns (with the price based on subscriber volume) or simply pay for each campaign as you go. 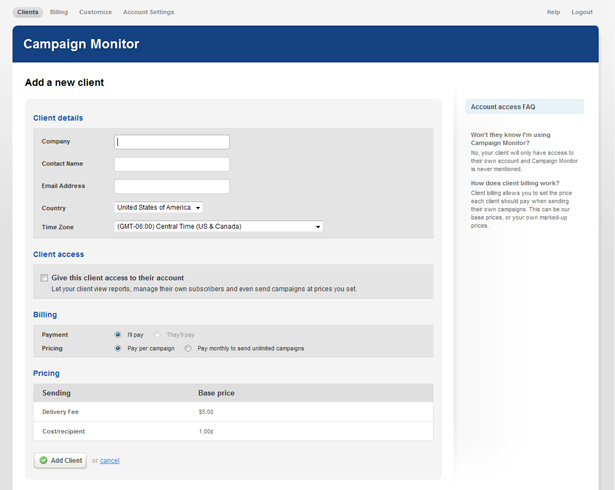 A great feature of Campaign Monitor is that it allows vendors to mark up their services. You can easily build a business around email marketing and earn a profit every time your client sends an email. Of course, you should provide an additional layer of value to justify the profit, but the system is in place for this if it fits your business needs. 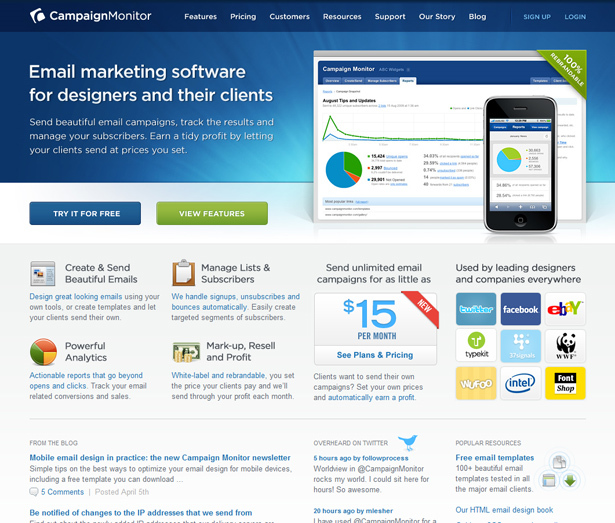 Campaign Monitor is a fantastic option for managing email marketing campaigns. You will be pleased with the extensive feature set at a reasonable price point. The platform is a little more technical, and not just because of the absence of a cheeky mascot. The design is very usable, but you may still feel a little overwhelmed at times. With time and use, though, you will find the system easy to use and powerful. It is ideal for those who have some technical experience and need extremely flexible tools. Constant Contact is slightly different. It is heavily targeted at do-it-yourself small businesses, relying heavily on social referrals via Facebook. It is also set up to help you as much as possible. It is one of the few services to prominently display a phone help line. It also offers real-time chat, a full-on learning center and seminars to get you started. This personal approach makes Constant Contact a very approachable platform and a perfect fit for small businesses. The main dashboard is not nearly as refined as the others we’ve seen, but digging in and getting started is still pretty easy; it’s usable, even if not highly optimized. Given its target market, it is set up for a low-tech approach to campaigns, demonstrated most clearly in the enormous range of templates. And what the templates lack in refinement, they make up for in sheer volume. You are pretty much guaranteed to find a solution for your situation. 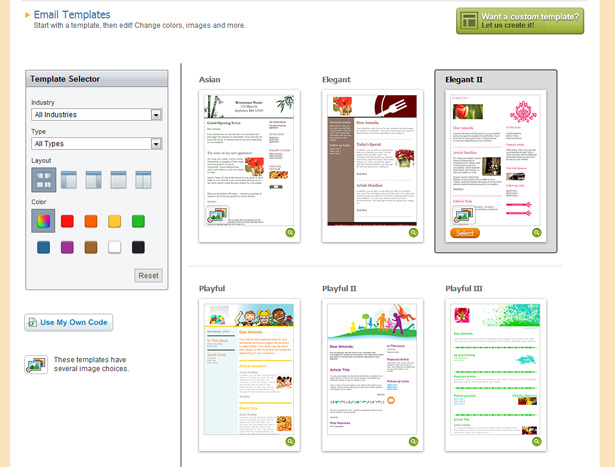 Selecting a template is easy, and putting it to work needs but a click of the mouse. Those unfamiliar with HTML will appreciate the streamlined system for creating an email. The editor virtually ensures that you can’t corrupt the template. You can go through and edit content without fear of blowing it up. 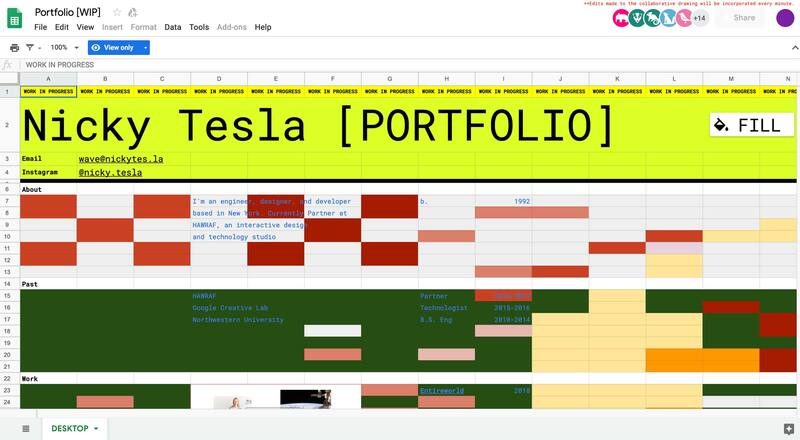 You can also easily add content that is not included in the template (such as social media links), as well as drag and drop whole blocks of content. The extensive customization features ensure that the system is flexible enough to meet your needs while keeping you out of the code. It’s a great balance for a low-tech audience. Constant Contact targets business owners with extended services like online surveys and event marketing. 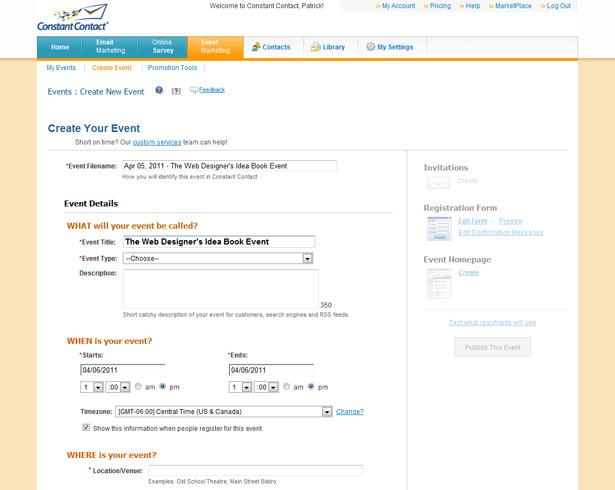 The event management feature allows you to promote and sell tickets to events. And because PayPal and Google Checkout are integrated, you can start selling tickets easily. 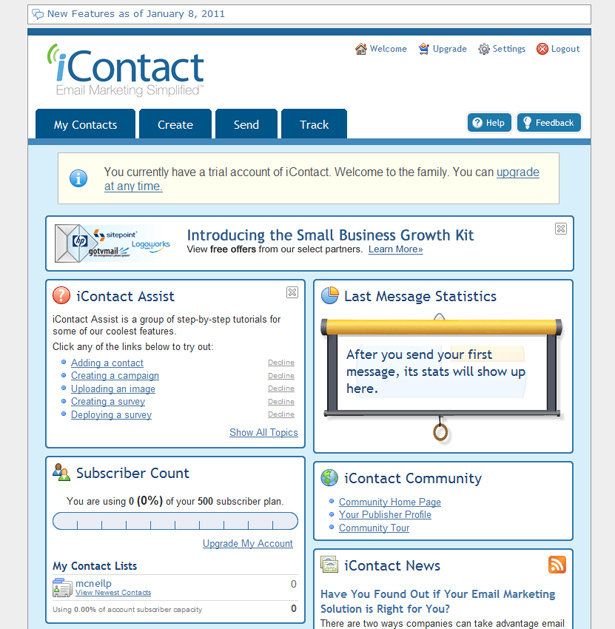 Even better, the feature connects to the email marketing system to help you promote and announce events. It alone will attract many businesses looking for an all-in-one platform. 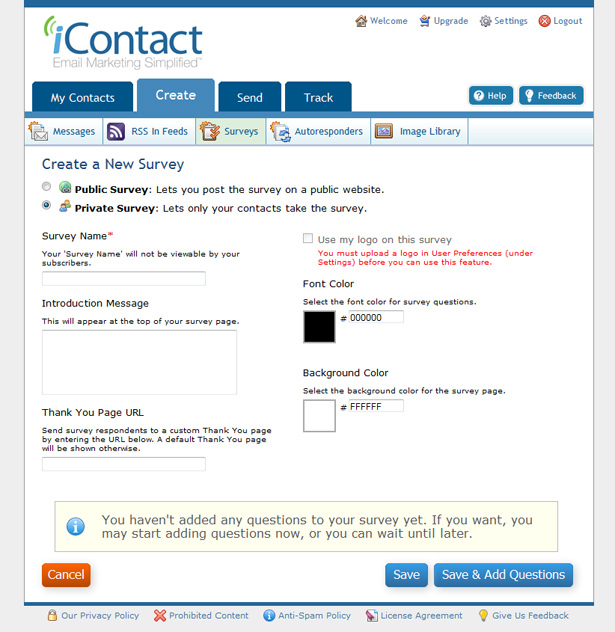 Online surveys might seem unrelated to email and event marketing, but they are a fantastic addition to this tool set. 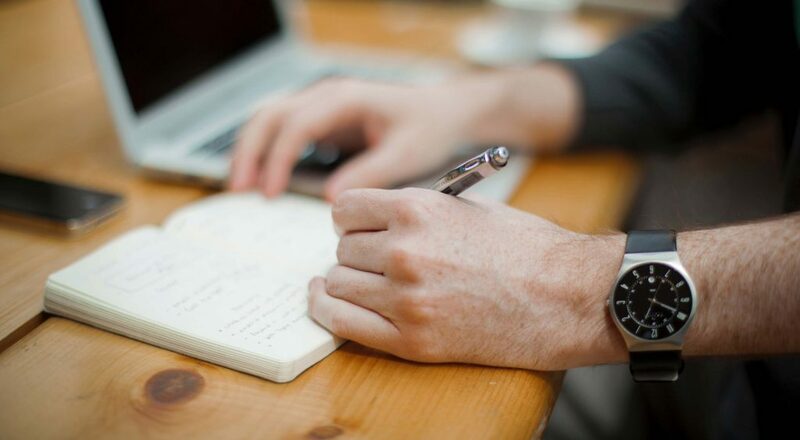 By creating and promoting surveys, you can figure out what your subscribers want head on. Instead of conducting many campaigns and mining the results for insights, simply ask users what they want. 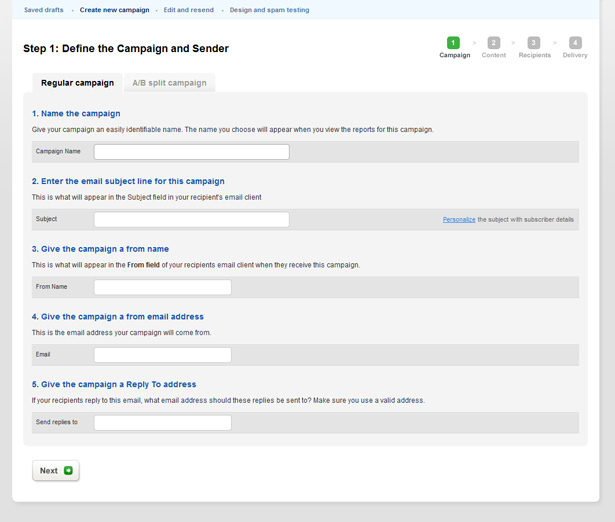 Even better, segment your mailing lists based on the candidates’ responses! Being able to ask people what they want and then marketing to them accordingly is a remarkable concept. And to make it silly-simple, a huge range of surveys are built in. Spam testing based on keywords and patterns (it actually reviews your content). 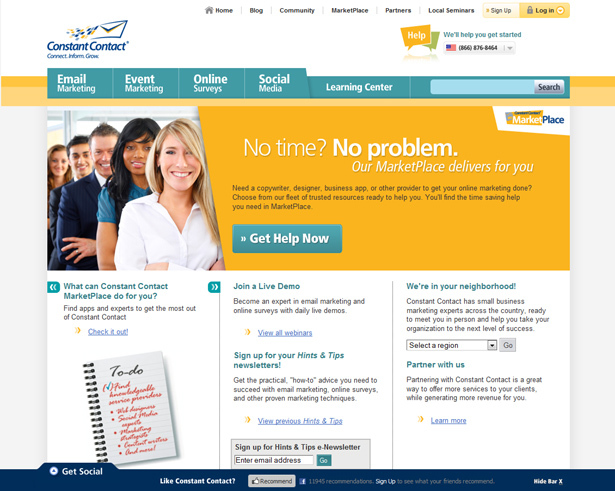 Constant Contact offers only one payment option, which is a monthly fee. Much like other services, the fee is tied to the number of subscribers and includes unlimited emails. Discounts are available if you prepay, which is nice. There is no ongoing trial for those who want to test the waters; but the free trial runs for 60 days, which should be ample time to try it out. This multi-featured marketing service might lack the aesthetic appeal of MailChimp and Campaign Monitor, but it is a serious contender. The bonus features alone make it a fantastic solution. The event promotion functionality, in particular, can be leveraged in creative ways. An event doesn’t have to be a conference or training session after all; it could be a sale or other consumer-oriented event worth promoting. In stark contrast to Constant Contact, iContact is geared more to experienced professionals looking for a robust feature set. Of course, it has the basic features you would expect, but with some extras that set it apart. You might be surprised upon logging into iContact. 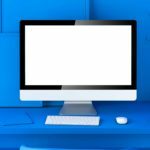 While the public website is polished and easy to use, the application itself is not so slick; it’s actually a bit much to figure out at first. The intent was to put a lot of information and options on the landing page. Some will be overwhelmed by the options, while others will grow to love the front-and-center approach. 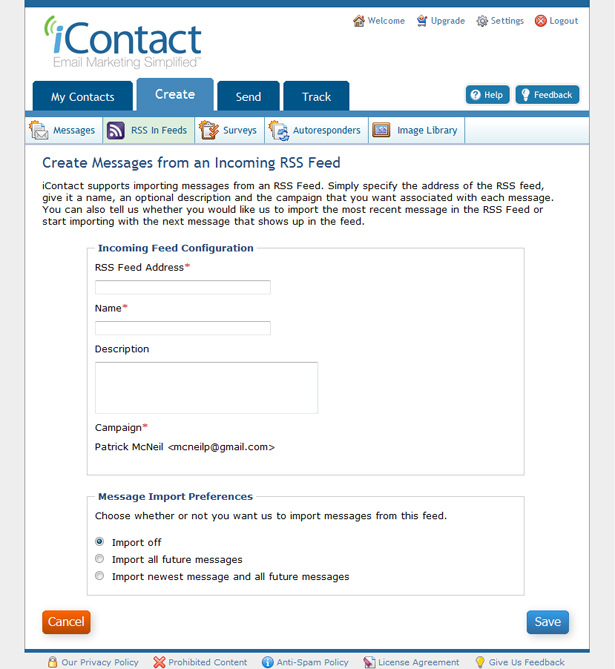 One distinct feature of iContact is the integration of an RSS feed-to-email tool. Services to spool emails out to RSS subscribers have been around for a while, and a number of options are available, but this one is integrated right in the email marketing platform. And it is an awesome feature. Not only does it make it easy to build a flow of content, but it also helps you manage the process and maintain consistent branding. Another great and rather unique feature is the system’s ability to send a chain of auto-responses. So, instead of someone getting a single email confirmation upon subscribing to a list, they can get an ongoing series of custom emails. You could pre-package three follow-up emails with special offers and information to entice them to take action. This is an incredible way to automate interaction with customers. One point of differentiation is the option of two approaches to building emails. You can take either a template-based point-and-click approach, which is simple for almost anyone to use, or a full-code approach for a custom campaign. This makes it suitable for a variety of users. 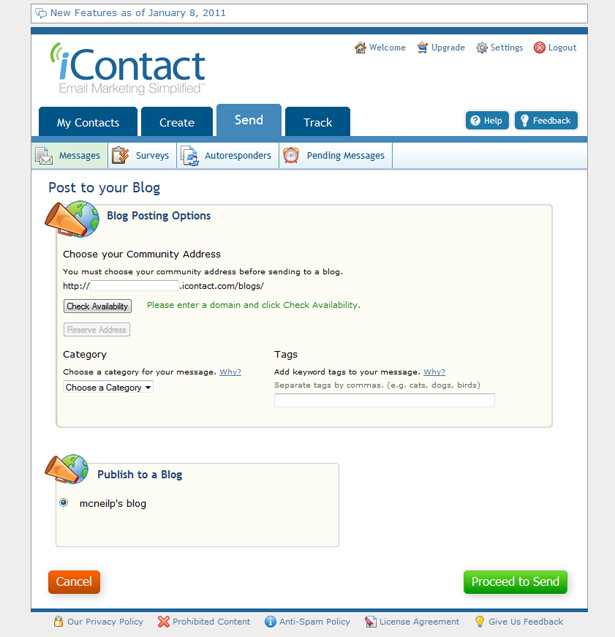 Another interesting feature is the built-in blogging platform, which allows you to post your content to a blog provided by iContact. 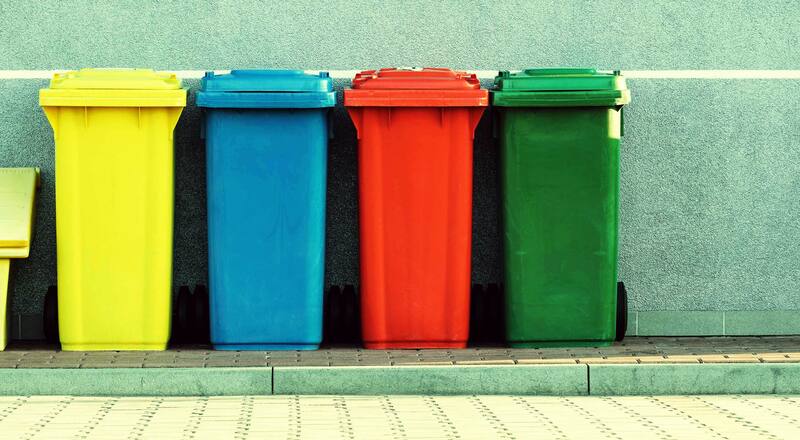 Publishing your content through this more public medium will help you get the most out of it. The only downside is that it doesn’t integrate with other blogging platforms. An API to publish to a WordPress website would be a nice enhancement. A key feature that many new customers are sold on is the extensive social media integration. While iContact does not cover a ton of platforms, it does handle the big two: Twitter and Facebook. The Facebook integration in particular is awesome because it allows you to easily post an email sign-up form right on your Facebook page. Finally, iContact has a survey feature that helps you gain insight into your audience, allowing you to segment and tailor your marketing to subscribers. iContact’s pricing model is based entirely on a monthly service fee. As with similar plans, it is based on your number of subscribers and includes an unlimited number of emails. While the entry-level price point is affordable, you’ll see that the prices are geared to big clients. Not that it doesn’t serve small client effectively: just think optimistically! iContact is a viable option for managing your email campaigns, and it comes packed with many useful features for automating tasks. 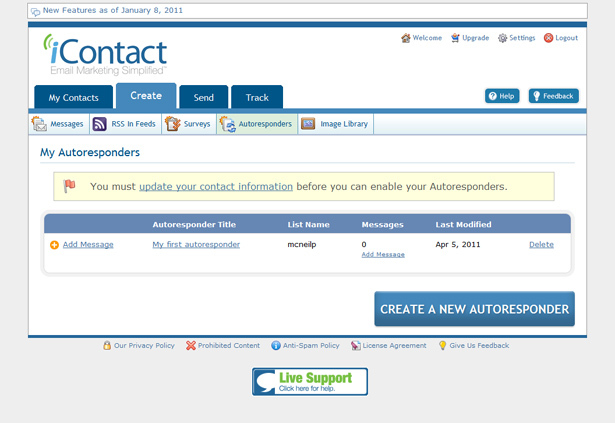 Features such as RSS-to-email and Facebook integration make it a serious option to keep in mind for your clients. 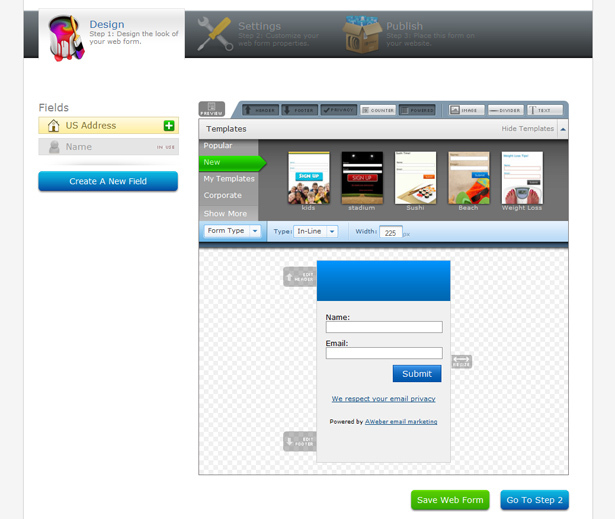 The admin interface could use some work; it lacks the consistency of a premium service. Still, the functionality is extensive and worth the trade-off. 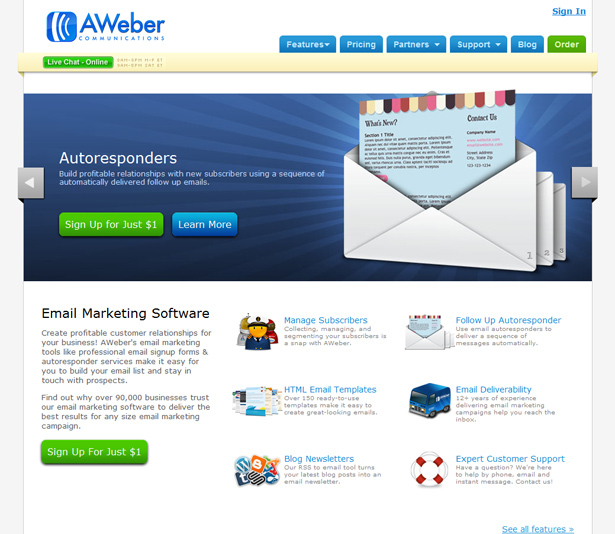 AWeber is an email marketing service with all of the standard features. At first glance, nothing really stands out. Dig in a bit, though, and you’ll find a number of unique features. The dashboard is clean and organized. Using it for the first time, you will likely be uncertain what to do next. Other services coach you along, but here you basically have a blank slate. If you’re brand new to email marketing, it might be confusing. 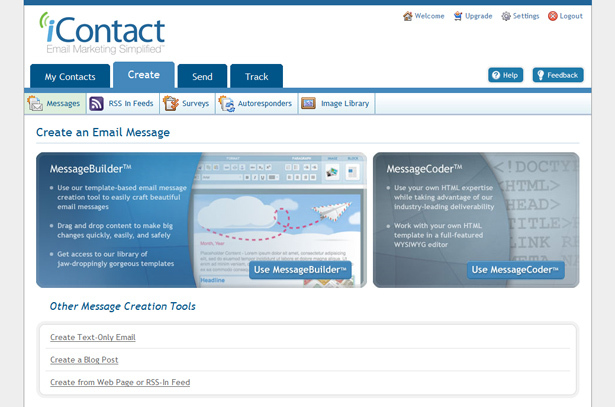 But if you’ve worked with email marketing tools before, then getting started will be easy. 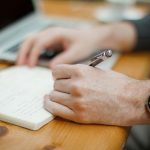 The first thing that stands out is the focus on helping you grow a mailing list, which is shown in several ways, the first of which are the tools for creating sign-up forms. 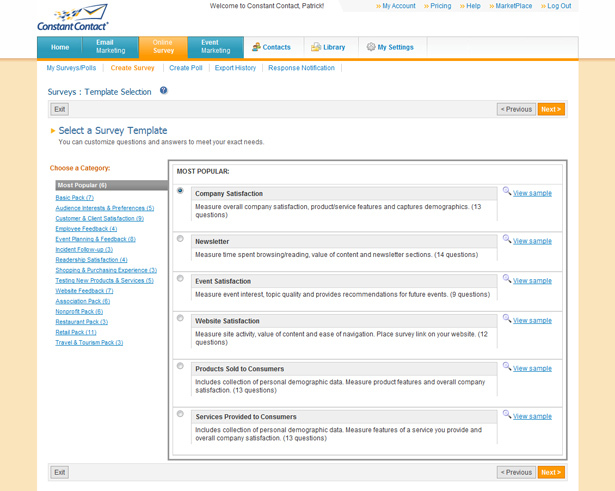 Below is a screenshot of the form-building tool. 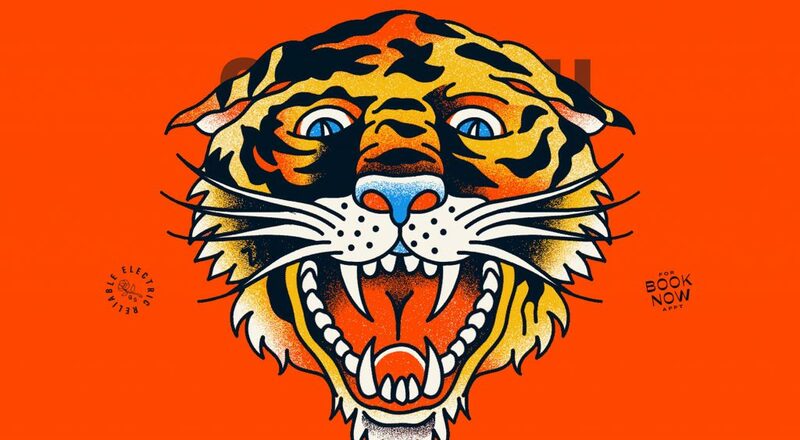 While the designs will not appeal to everyone, many will welcome the help. 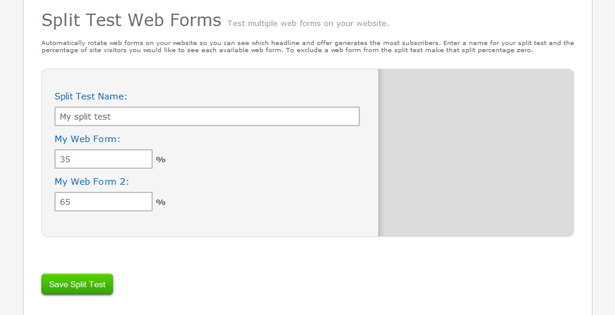 Regardless, the form builder is powerful and enables you to build as many interfaces as you need. 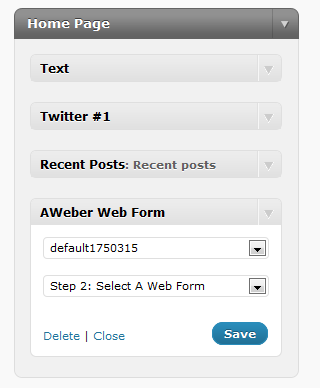 AWeber also helps you run A/B testing to find the sign-up form that works best. I have not seen this offered by any other company, but it makes perfect sense. The simple concept is the beginning of a long-term growth strategy for your mailing list. 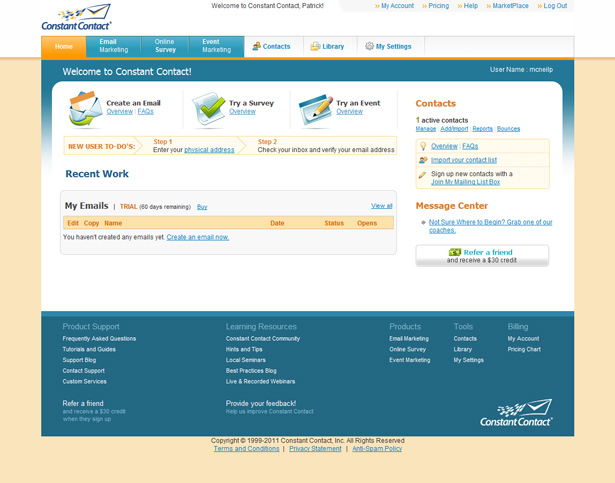 The system provides the usual ways of embedding a sign-up form on your website, as well as one unique way. 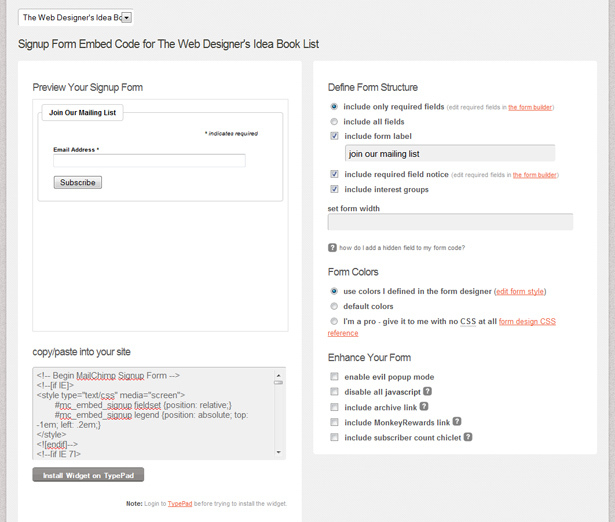 There is a WordPress plug-in that allows you to quickly select and embed the form. 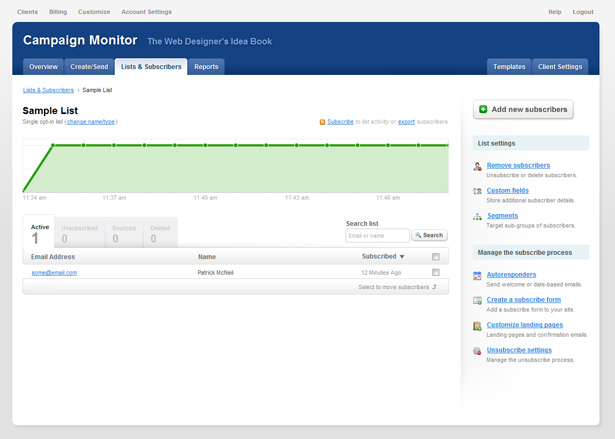 The screenshot below shows the WordPress widget management tool. It also allows you to insert split-testing groups. AWeber’s approach to third-party integration is also interesting. In the navigation, it is labelled “Email parsers,” which seems unusual, until you understand the reasoning. Imagine that you run an e-commerce website and that your main payment method is Google Checkout. Perhaps you have an email sign-up form on your website. But how do you get people who complete a purchase onto your mailing list? Usually, you would have to manually add them. With AWeber, you can set up email parsers to skim the confirmation emails in your payment system, and then have people automagically added to your mailing list. This type of integration is slightly different, but the focus on growing your mailing list is much greater than in many of the other systems you’ll find. Speaking of email parsers, there is another useful feature, this one focused not so much on growing the list, but rather on keeping it organized. Going back to our e-commerce website, say we have a single mailing list with all of our customers and prospects mixed together. Tracking who has made a purchase and who has not would be difficult, so we might just lump them all together. AWeber makes this segmentation easy with its automation feature. A paid user would trigger an automation filter in the email parser, and the filter would unsubscribe them from the “general prospects” list. In this way, you could automate the process of moving users from the general pool to the more targeted list. Another example would be to provide options for users to subscribe to daily, weekly or monthly updates. Through automation, you could prevent them from ending up on more than one list. Two more features deserve mention. First is the system’s ability to send sequential auto-responses. This chain of emails will automatically market to clients and keep them engaged through a controlled chain of events. 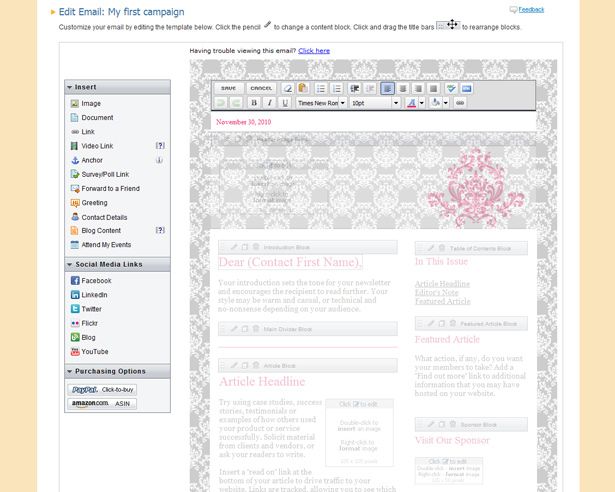 Second is the automated feature that sends a digest of your blog posts as an email blast to customers. Email parsers to automatically populate lists from e-commerce transactions. 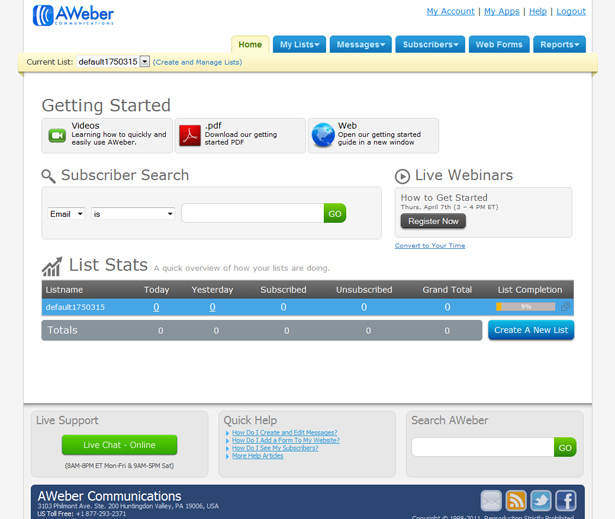 AWeber comes with a monthly fee based on the number of subscribers. It includes unlimited emails. Unfortunately, a free trial plan is not available, but you pay just $1 for the first month, which is not much of a commitment. AWeber will surprise you. On the surface, it appears to be yet another email service. But as you get into it, you will find it stuffed with incredibly useful features, all simple to use. It may not have the cool feel of MailChimp, but it performs every bit as well. My only gripe is that you have to pay to try it out. In a world of free trials, this seems odd. Hopefully, customers will discover the benefits, but hiding this powerful tool behind a $1 road block seems like a shame. The challenge of selecting an email service provider is considerable. The decision can be made extremely easy, though, simply by trying them out. You can usually tell quickly if a service is what you’re looking for. Hopefully, this review has saved you time in assessing their capabilities. Offering multiple options to our clients is wise. By sticking to only one, we may become proficient in it, but we don’t really help our clients make an informed decision. And helping them make informed decisions is a key to building long-lasting relationships. Disclaimer: WDD and the author were in no way compensated to review these particular products and these reviews are solely based on the author’s own opinion.